Last year I talked to some of my family and friends. I mentioned that 2017 would be the defining year for me to decide whether to continue making games or quit. And suddenly, 2018 came knocking and a particular question was thrown a lot. "So, 2017 has passed. Have you decided to continue or quit developing games?" It’s a tough question to answer because everyone in our studio was betting everything on our last game, My Lovely Daughter. Let me start the story from the beginning to give you a full understanding of our situation. 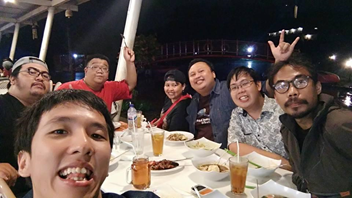 Our studio, GameChanger, is an independent game studio based in Indonesia. We’ve released two games on Steam from 2016 to 2017 and they did not do well financially. Our first game, NSFW ~ Not a Simulator for Working was a hit with Youtubers and streamers when it was being developed due to its weird theme, sadly it did not perform well sales wise. Our second game, Ascender, actually started development long before NSFW and went on hold. So, we used whatever money we had from NSFW sales to finish and release Ascender. Unfortunately, the game was a failure and sales performance was ridiculously bad. The failure of Ascender foreshadowed that we might close our studio soon. We decided to make one last game and bet everything on it. 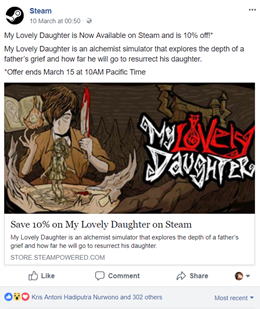 My Lovely Daughter is an alchemist simulator that explores the depths of a father’s grief and how far someone will go to get something they had lost. It is a game that was originally developed by teammate Marcel, Roderick, and Alessandra as part of our internal game-jam in November 2016. The game idea came from a simple concept of ‘killing a creature that you created’. The game also becomes a medium for some of our team members to express their own experience of having a very tough childhood and growing up with strict and/or abusive parents. Parents who manipulated and exploited their children for their own gains. Such as forcing their children to be someone they are not to fit the parents’ own ideal, or forcing them to do hard labour, “killing their souls” in the process. It’s a taboo topic that is rarely discussed but happens more often than we think. Through this game, the team found an opportunity to talk about it. During the internal game-jam, we had also invited friends from other studios to be judges and give us unbiased feedback. They thought that My Lovely Daughter has a unique hook and interesting concept and picked it as the winner of our internal game jam. This convinced us to continue working on it and develop it into a full game. Around December 2016, we put the game on greenlight to see if people would be interested in the concept. 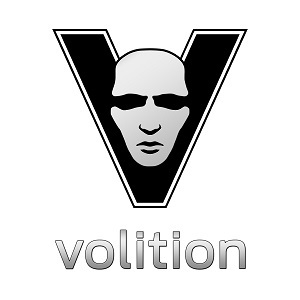 The result was positive, within 2 weeks the game got greenlit. 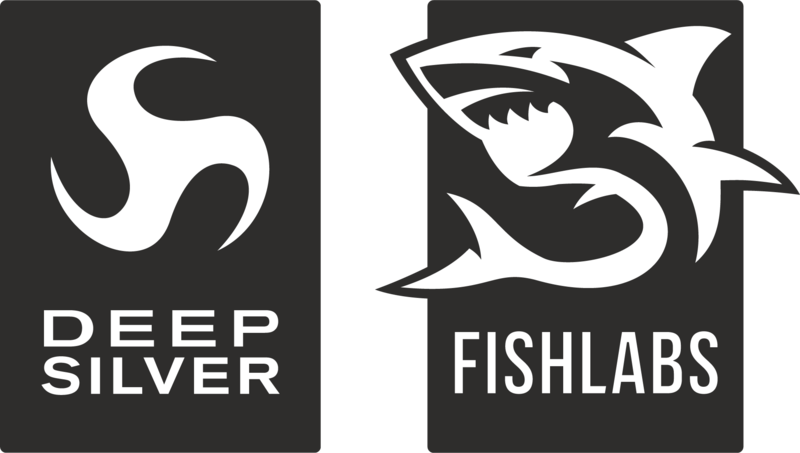 We were excited and planned to release the game in April 2017. At the time, I was not really involved with the game. I was just advising on the game design aspect of the game because I was also working on other projects. During development, we had a lot of setbacks. Alessandra can no longer be with us because she had to go back to her hometown, and Marcel could no longer work full time in the studio. So, we had to restructure our team. This also meant that I had to switch gears from being an advisor to the game’s full-time designer. Around this time, we had again changed our target release date from May to September 2017. We had some contract works that we had to finish, but we refrained from taking new contract works and from going to game events so that we could dedicate our time to the project. This was also the time when we started to discuss more the condition of the studio with our team. We came to the harsh realization that if My Lovely Daughter fails then we would have to shut down our studio. We tried to secure more funding from additional investors to help us cover our expenses and keep the project going. Sadly, we could not find anyone willing to take the risk. Our failure to approach investors led us to cut our salary, it was one of the hardest decision that we made during the project. As the founder, Riris and I stopped taking any salary in order to make sure that the others were getting paid. Riris decided to go back working full time as a librarian and found time to work on the game. She still went to our studio after her office hours. For me, I continued my work as a part-time lecturer. I also needed to sell my Wii U, iPad and PlayStation to make ends meet. We managed to even share responsibilities, Faiz (sound designer) and Roderick (programmer) helped with taking care of the studio and accounting studio expenses. Even with that approach, our money was still not sufficient, we had no choice but to take contract jobs again in order to make sure we survived. A great opportunity came and knocked on the door. Our friend, Jonathan Manuel from Toge Productions (TOGE), who we invited as a judge in our game-jam took interest in My Lovely Daughter. We had told him about our financial problems, Jonathan told us that TOGE has just started a game publishing initiative in 2017 and that they might be able to help. According to TOGE’s publishing team, although our gameplay was still far from ideal the game had a lot of hooks (such as the catchy title, the controversial theme, and interesting alchemy mechanic) that showed a lot of potentials and it had a strong thought-provoking message. TOGE pointed us the weaknesses of the game and told us how we might improve it. This was exactly what we needed to hear, a fresh perspective and proper guidance from a trusted friend who has a lot of experience. TOGE gave us development support and funding, and we both agreed to work together. Finding the right combination of art, gameplay, and story for MLD was a challenging task. Every time we made some changes, we kept reminding ourselves to stay focused on our vision. TOGE also reminded us to also focus on the original game’s core message, which was a commentary on abusive parents. It was a tricky message to deliver even with TOGE helping us through the design exploration process. We went through several design changes on the game’s mechanics. We even developed more than 5 prototypes with different gameplay, from a Tamagotchi style game to the simulation/management game that we currently see in the final release. This was a tough process, as each iteration meant that we were pushing the development timeline further back and draining our reserve funds. Despite the hardship, we have no problem with dumping our ideas or even a proper working prototype to make sure that the vision of our game is achieved. The game-jam prototype had a mechanic where players would raise a blob creature, feed them and play with them, just like a Tamagotchi game. Players need to figure out combinations of stats and when the blob reached a certain condition it would evolve into “daughters”. It was interesting at first, but the process quickly becomes tedious and frustrating for players. The alchemy summoning mechanic was also frustrating in the early versions of the game. In the beginning, there were a lot of combination permutations and players will not get a homunculus when they choose the wrong combination. This was proven to be too punishing. So we decided to reduce the number of permutations and award players with a homunculus even when they fail. 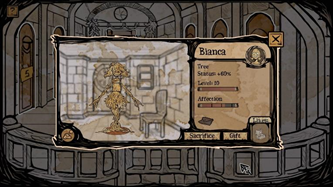 In the end, we focused on building gameplay experience around the player’s emotional attachment to their homunculi. Since players would eventually kill every homunculus that they created, we want each moment to be meaningful, hard and perhaps painful. We would focus on elements that would strengthen that emotional attachment and this would become our main design pillar. Features that did not align with this pillar were cut. 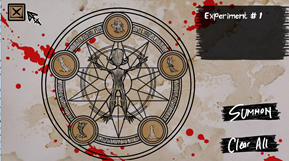 We deliberately designed the game so that players have to kill their first homunculus as early as possible. We think this is a great decision, as it didn’t only surprise players and hooked them in early, but it also gave them a warning and set their expectations for the things to come. This way players know from the beginning that they would eventually have to kill every homunculus they’ve created, and with each interaction, the guilt and horror grow as anticipation builds. Allowing players to name each homunculus and give them gifts also intensifies their emotional dilemma. One of the features that were crucial to building player’s emotional attachment was the Affection System. It’s a simple variable that measures how well the player treats their homunculi daughters. The affection meter will grow and it will unlock hidden letters when the player gives presents and spend time talking with their daughters. However, if the player neglected their homunculi daughters, they will run away. This system creates a positive reinforcement towards the player to better take care of their “daughters”, making the final moment, when the player has to kill them, much more painful. This feature was actually added very late in development after we saw a Siliconera article covering the game’s earlier builds and saw that people compared the game to Princess Maker and expected the final game to have some relationship sim mechanic. My Lovely Daughter’s art style has been a prominent element that becomes distinct compared to all the game that we have developed before. The original artist, Alessandra, expanded her original concept of paper motion storytelling. She wanted to create a unique gothic style that combines thick black outlines with dirty, mouldy and old paper texture. 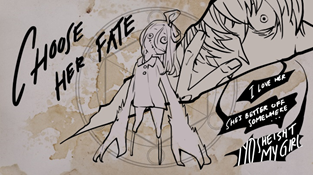 Two of her main references are Don’t Starve game and cinematic animation of Alice: Madness Returns. The biggest challenge for art development was when Alessandra could not continue developing the game because she had to go back to her hometown. The responsibility of the lead artist was handed to Daru. Initially, it was his big challenge to recreate the art style that Alessandra had but slowly he can do it easily as if it was his own. 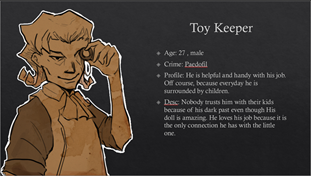 As the game grew to be more complex, Daru also needed to improve and polish the art style that best suited the game. He added woodcut texture and colour shading in order to give clearer distinction to which area of the game that is interactive. This is important because, during testing, the players at first is initially amazed by the art style but confused when they play the game. Another element that plays an important role in building emotional attachment was the narrative. Our writer, Marcel, had never written a dark story for a game before. It was a huge challenge for him to finish writing the story for My Lovely Daughter. The game started with a vision of what kind of experience that players will have playing the game. Starting with that concept, Riris, Marcel and I had a lot of discussions. Since Marcel and Riris were not working full time, we usually had the discussion over the weekend or after office hour until midnight. We started by writing a single page of game story design, we used Freytag's dramatic structure to design the story plot. We decided to build the world before writing the story in detail. Marcel wrote an overall synopsis of the story, then we created the world setting and the characters who will surround Faust and his daughter, Arhea. Another challenge we had was when we finally reached the phase where the narrative started to intertwine with the game mechanics. Marcel needed to know what kind of narrative that the game required and how was it going to be told to the player through the game’s mechanics. A lot had to be filled in so I helped him finish some of the story content with his supervision. Since English is not our primary language, our writing pretty much sucked. Again, TOGE helped us by bringing Nick Didier from 99Tales on board to improve the game’s writing. We could feel the improvement almost immediately. Nick took all of the narrative elements that we had created and improved them. With Nick’s writing, we could feel the characters become more alive and the story becomes more intense. During the testing of the latest build of the game with the added affection system, we’ve got the even more positive response from our early reviewer and tester. With many changes, the game is postponed several times and at the time we had planned to release the game on September 2017. We realized that we needed a bit of more time to finish the game. Releasing the game on Q4 of 2017 is a nightmare because we would compete with AAA title. January is also not a good month because people had just spent their money during the holidays, the same thing also for February where Valve held a Lunar New Year steam sale. For those reasons, we decided to release the game on March 8th, 2018. We took the time to balance and polish the game. We also used the time to proofread the additional dialogue and localized the game to the Chinese market. TOGE collaborated with Another Indie (yes, the company is called Another Indie) to localize and publish the game simultaneously in China. As a small studio, this was something that we have never tried before and we’re excited with the possibilities from the collaboration. On launch day, we tracked the performance of the game through our analytics. The first day of sales was very weak. We managed to only sell around 400 copies on the first day. However, on the second day, it jumped to more than 1200 copies sold. We found out that Steam had announced the game’s release on social media. We don’t exactly know how this happens because we were never in contact with Steam regarding promotions, we suspect it’s just Steam’s algorithm doing its thing based on what was trending at the time. Lucky for us, the combination of our game title and Steam’s post caption had become a clickbait and brought a lot of traffic. Localizing to China also helped us boost sales. In less than 5 days, we have reached more than 10.000 copies. It might not be a huge number but it’s beyond our expectations. To this day, sales from China is 3 times larger than sales from the US. However, we gradually received a lot of negative reviews from China, mostly complaining about the dark and twisted nature of the game’s story and repetitive mechanics. And because none of us can speak Mandarin, we couldn’t engage with them and respond to their complaints directly. What we learned from My Lovely Daughter, is that by sticking with the vision of our game it helped us make tough decisions. We learned that killing a lot of features and prototypes is worth the sacrifice, by doing so the whole team can focus on what really matters. We are glad that our publisher, TOGE Productions, is on board on this approach. One of My Lovely Daughter’s downfall is that there are players who felt that the content of the game is lacking. We consider this to be our weakness in balancing the content and play time. In the future, we have planned out some free updates for the game while also adding more content. 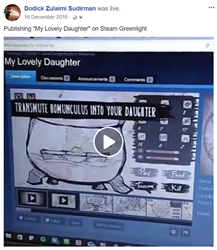 Be sure to check out more about My Lovely Daughter on steam. I guess… with this success, I can safely say that I’ll be sticking around to continue developing games.